Je suis pasteur et formateur de pasteurs en Afrique, Europe et dans le Pacifique depuis 1978 et avec mon épouse depuis 1982. Nous servons au Vanuatu depuis août 2007. Nous sommes mariés depuis 1982 avec deux enfants qui sont tous deux nés en 2001. Je partagerai quelques pensées sur la vie de l’église et la vie chrétienne d’une perspective pastorale. Le pasteur berger prévoit et prévient. Il protège (Jean 10:11-13). Il guide et il conseille. Il « enseigne, convainc, redresse et éduque dans la justice » (2 Timothée 3:16-17). J’espère que ces perspectives vous seront utiles et salutaires. 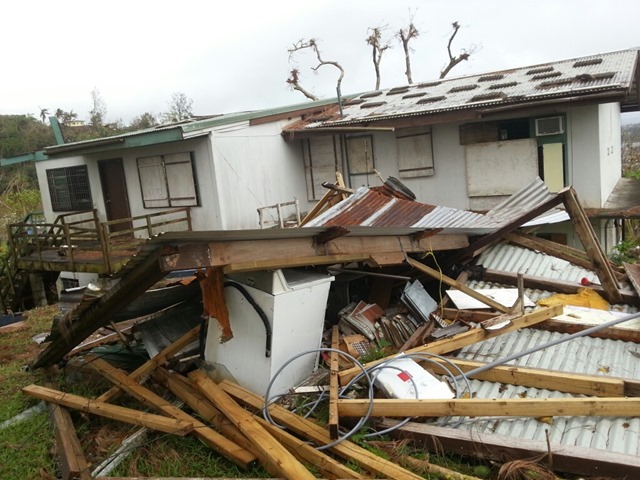 Many of you may not know that Lori has served on the AG Vanuatu National Disaster Committee since its founding in 2015 after Cyclone Pam. She is the committee treasurer and has spearheaded much of the fundraising to help each of the 60 Assemblies of God churches affected by that natural disaster. 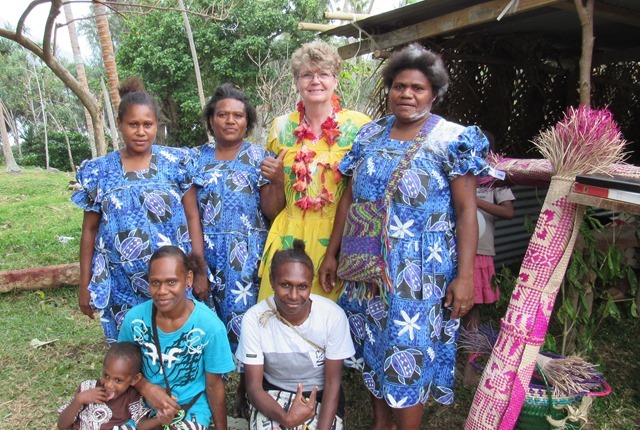 Here is the story of her recent trip to the island of Paama for a church dedication. A week ago Sunday, we were at the Port Vila airport waiting to board a small charter plane to Paama Island. 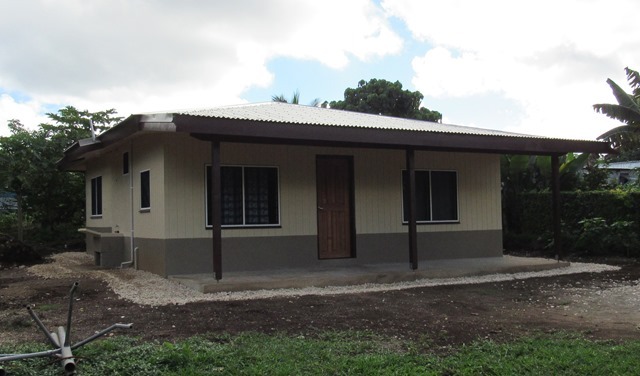 A dozen of us were going there to celebrate the opening of two newly rebuilt churches destroyed by Cyclone Pam in 2015. The weather conditions were not good with strong gusty winds and rain. 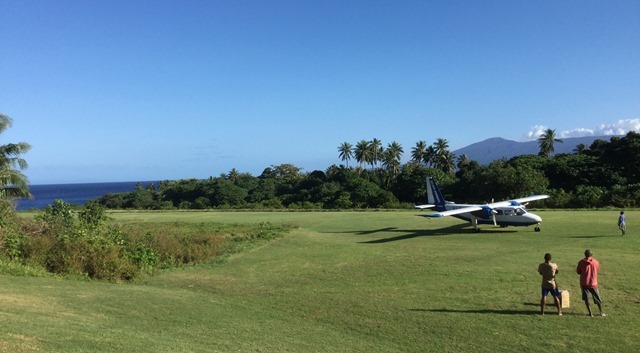 The grass airstrip on Paama has a short one way landing and take-off over an ocean cliff. Crosswinds are often challenging on small islands but the current conditions were especially unsafe and our flight was cancelled. We went to the airport the next three mornings in a row but the national airline was not intending to fly to Paama anytime soon. 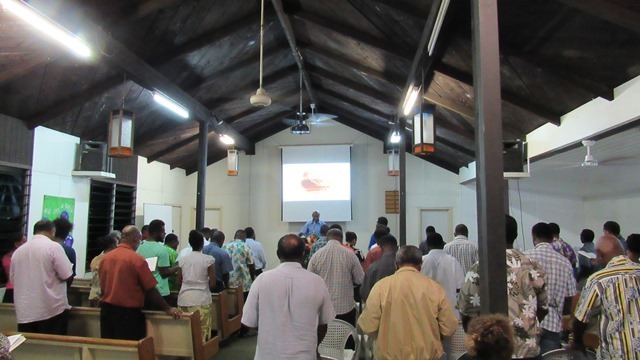 On Monday, the Tavie village church had their dedication service without us. We were very disappointed not to have been there. Gary was to be the guest speaker and Lori had been asked to unveil the new church sign. We heard that a small plane from a charter company had landed at Tavie on Monday without mishap so why could we not go too? 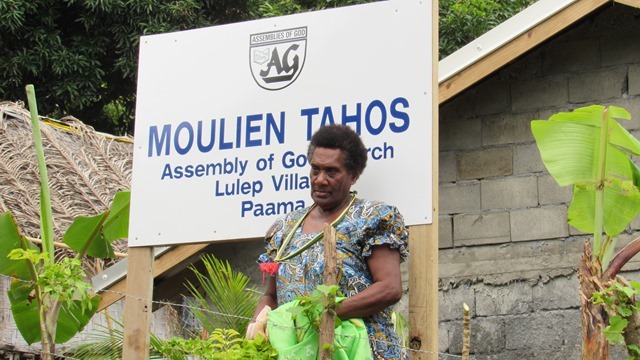 The second church at Lulep village was to be dedicated on Tuesday but they had postponed the service in hopes that the group could get there. Lori had promised the people at Lulep two years ago, that when they rebuilt their church she would be there. So even though no one else could go with her, she booked a seat with a one-plane charter company. Finally, on Wednesday morning, bright and early, Lori flew out on an 8 passenger plane to Paama. An excited welcoming party was waiting for her at the Tavie airport. The only vehicle on the island, a four wheel drive truck, was coming to take her up over the mountain to Lulep on the east side of the island. The Lulep church had already butchered a cow and were cooking a feast. The church dedication would start as soon as she got there. Before the truck arrived, a text message came stating that Pastor Jimmy Obas was in the air and on his way to Paama. Miraculously, he had convinced the pilot of an even smaller plane flying north to drop him off on Paama Island. Rev. 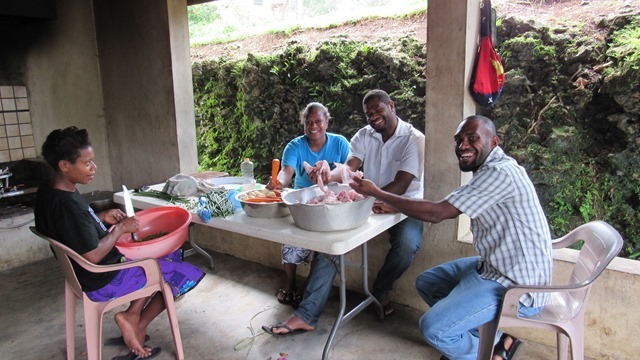 Jimmy Obas and Lori, are colleagues on the AG Vanuatu Disaster Committee which spearheaded the fundraising and assistance to the 60 AG churches affected by Cyclone Pam. Within the hour, the truck was loaded with supplies, a keyboard, pastors, and Christian friends ready to accompany us to Lulep. With only one truck driving along the bush track, you can imagine that there really wasn’t much of a visible road in many places. 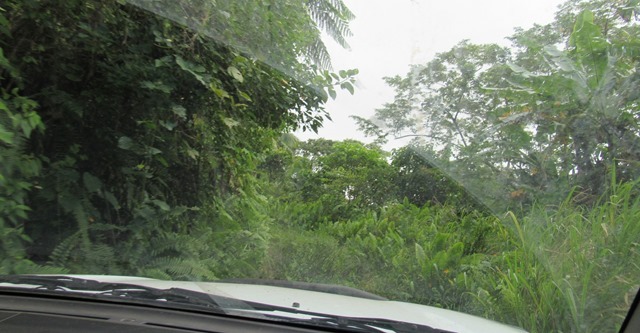 We twisted and turned through gullies, drove straight up the sides of hills and slowly climbed to a mountain top before glimpsing a large volcano and then nosediving back down through the rainforest. Before noon, we were safely in Lulep, shaking hands and meeting Pastor Avock and the congregation. That is when Lori found out she would be cutting the ribbon and preaching the dedication message. 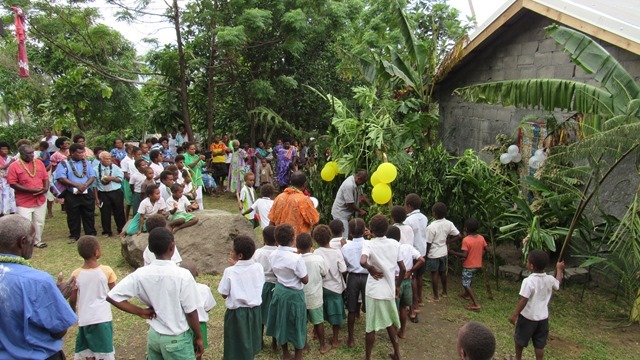 School children, church members and villagers gathered on the village green and marched to the new church building singing “We’re Marching to Zion.” The church sign and gate were obstructed by all kinds of branches and foliage. Brother Aison came forward with a machete and began to cut at the foliage and make a path for us all to enter the property. This was a symbolic gesture of making a path to God’s house. The church sign was unveiled by the grandmother who had donated the land and we all marched to the church entrance. Again the church door was completely obstructed by banana trees and branches and again Aison came and cut a path. 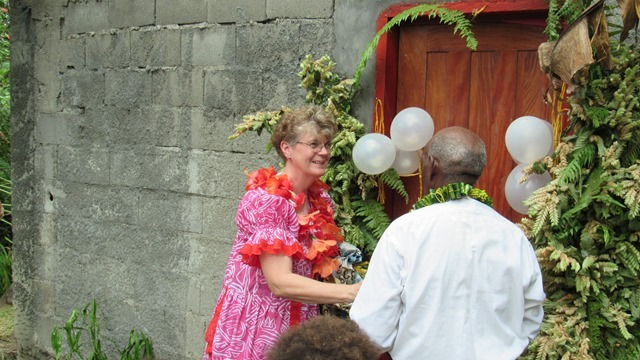 Lori was then able to approach the church door and cut away the ribbon and fabric. A quartet of ladies sang “Open the Door” and Lori handed the keys to Pastor Avock and he stepped inside first and everyone followed. The church interior was completely finished, the cement walls nicely plastered and painted. Pastor Jimmy Obas led the congregation in singing and then Lori preached from Colossians 2:2-7, on The Marks of a Faithful Church. 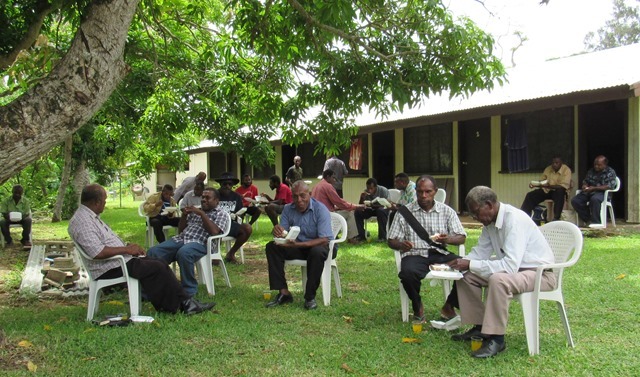 Following the service, we went to an open area and sat on the grass and enjoyed a wonderful lunch. Lori spent the night in the home of one of the church ladies before crossing back over the mountain and staying two more days in Tavie village. 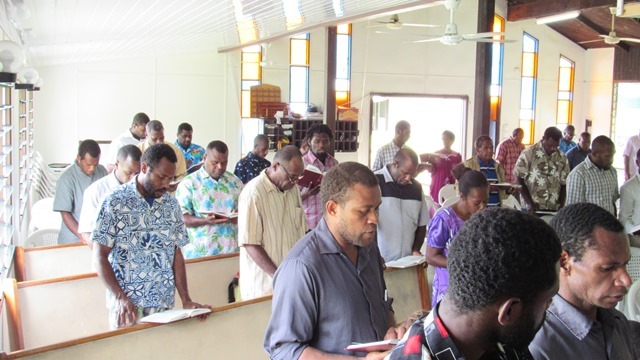 Thank you for your support which allows us to be in Vanuatu training young men and women for ministry at Joy Bible Institute. 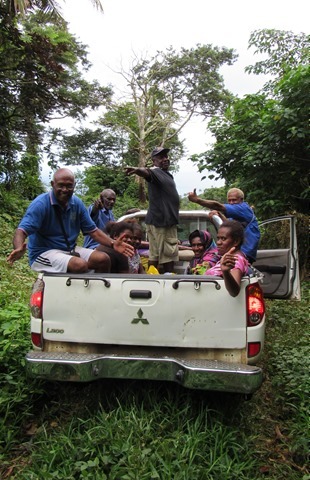 Pray that we will continue to be instrumental in making a path and stepping through open doors for the sharing of the Gospel on small islands and remote villages all across Vanuatu. 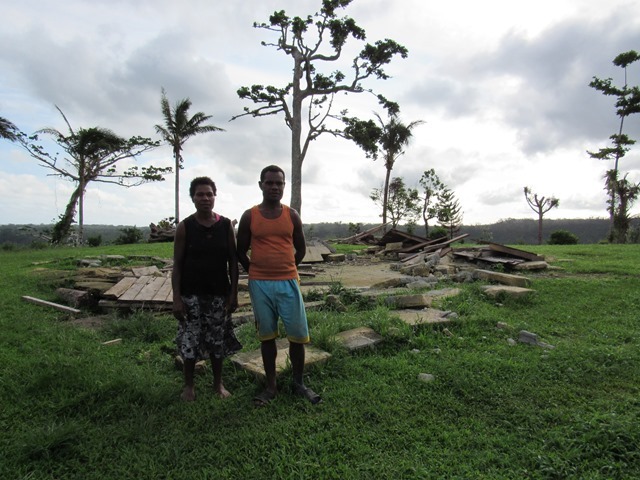 · Two other AG churches on Paama, in the villages of Tahi and Luli, need help to rebuild their churches. $5000 would greatly help their rebuilding. 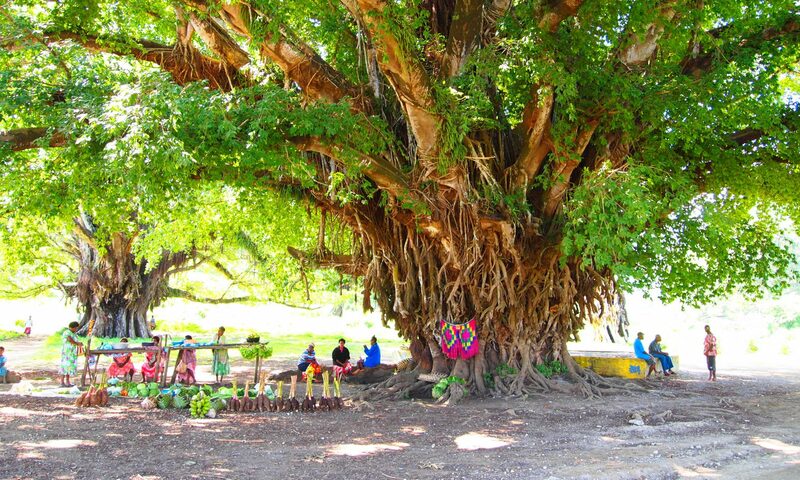 · Our own monthly support also needs strengthening. Would you consider partnering with us? “…giving thanks always and for everything to God the Father in the name of our Lord Jesus Christ” (Ephesians 5:20). The Spirit-filled life is one of continual thanksgiving to our heavenly Father for everything through Jesus Christ our Lord. We have much to give thanks for at this season of our lives. 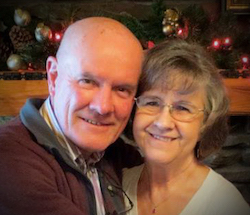 Gary was unexpectedly diagnosed with aggressive prostate cancer after a routine medical checkup in June. After many tests, he underwent surgery on September 13th. 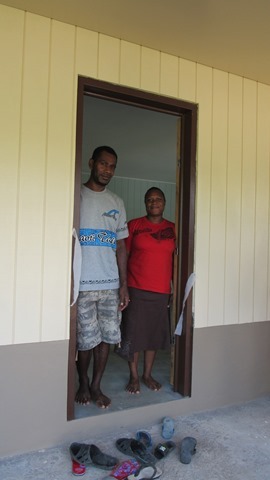 He is doing very well and his doctor has given him clearance to return to Vanuatu. We give thanks! We have been able to visit so many friends and speak in many churches this past year of itineration. We are so thankful for the continued support of long-term partners and the new partners who have joined us. 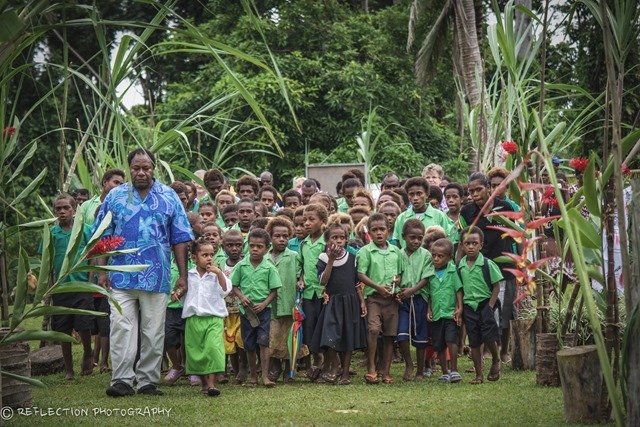 We have raised our budget and have been granted clearance by AG World Mission to return to Vanuatu. We give thanks! Logistically it has been difficult to be away from Joy Bible Institute (JBI) for 4 school terms. We left without a replacement couple to teach in our place. It was most often at the last minute but we give thanks to Jack Kay and Rudd, Ray and Becki Sparre, Maurice Nicholson and most recently Sam and Lisa Paris, who dropped everything and went to JBI to teach our wonderful students for us. We are so thankful for each one of them! We are thankful for pastors Kiel Maimai and Philip Naias, our permanent JBI teaching staff who have faithfully continued to train and mentor young men and women at JBI in our absence. We are thankful for Mrs. Shannon Kombe who has been working as our JBI office assistant since February. Joy Bible Institute graduation takes place on November 26th. Our 2017 graduates have finished three years of pastoral training and are ready to go to those who haven’t yet heard the Good News. We are thankful for you, your prayers, and your partnership in the gospel. Keep us in your prayers. Some friends have written a cool new app called GiveWay to help you financially support missionaries with your “loose change.” When you make a purchase, the amount is rounded up to the next dollar and the difference is given to the missionaries or missions agency that you have designated. You set the parameters and the limits. Plus, it works with Android and iPhone. 1. Choose one of five AG ministries. 2. If you chose AGWM, you can add a missionary. 4. Type the missionary’s name, like Ellison! 5. You can add another missionary or organization, or just click Submit. That’s it! That’s just one more way that you can partner with us or other Assemblies of God missionaries or Assemblies of God missions agencies. Thank you!